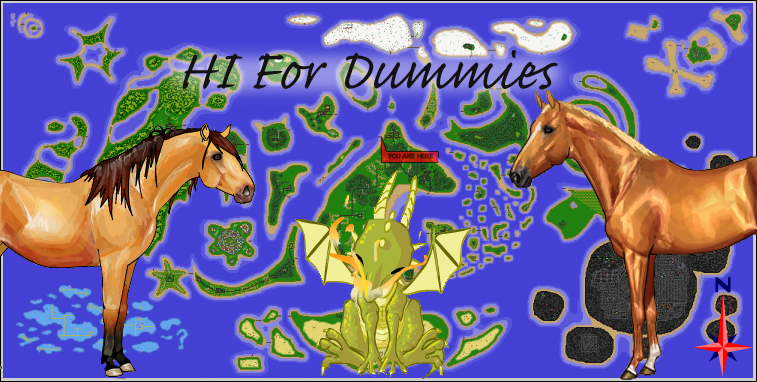 Welcome to Horse Isle for Dummies! If you have any problems: bugs, crashes, or information is wrong please contact us through the Contact Us forum. To find out all the lastest news on Horse Isle or the site please scroll below. We also ask you NOT to steal any information (text and pictures). If you need something ASK me and we'll discuss it. A huge shoutout for SassySilver, my good friend who used to help with updating this website. While she no longer plays, her information is still available! [December 12, 2017] Adding Quests! Since I've restarted my account, I'll keep a list of the quest I'm doing and adding today! This list will be updated at random, keep an eye out! Wow! It's been almost two years since my last post, but I'm here with small updates! I've added a few quests to the A's, and updated a few payouts for the B's. I'm working on re-editing all the images, as they're mostly on HUGE white backgrounds (an issue we've had for a few years now). All the new images are being reuploaded onto Imgur to make my life easier. That being said, I've updated all the old images for the Unmappable NPCs! I'm trying to get back into Horse Isle, and I'm looking for help! I'm back on Dun under the username Conquest. If you're interested, shoot me a letter or email me at lightning.theif1@gmail.com! Put "HI For Dummies" in the title so I don't skip over it! I don't think I'll be making a masterpost of all the game updates I've missed, but I'll try and update for the next one! EDIT: (2/22) I've finally fixed it! Sorry for any inconvenience! It seems to be that uCoz isn't putting pages in their proper places, or deleting the test page. I'd like to extend our apologies on that, but I'm also not sure how to fix it since everything is exactly how it's supposed to be. I'm hoping it resolves itself somehow. Wow, it's really been a while, huh? I'll go ahead and list what site updates I can, from newest to oldest. How about those payout increases? The following code changes have been made on Horse Isle 1! Not everyone will appreciate all of them, but for the most part they should be welcome. We made a few slight economy tweaks, but stopped short of doing much more. We also know the color/height magics are of mixed review, but their use should be pretty rare, considering price and benefit. Players can decide for themselves whether a horse with magic residue is worth more or less going forward. In any case, we hope you enjoy the following changes made to the Secret Land of Horses! Sass here. Haha woah, this is a total blast from the past. I recently came across this site after quite some time of not updating it or playing Horse Isle anymore. After I went through all the pages again, I would like to apologize for the lack of updates and the failure to finish the quest page along with other pages. And so, I would like to say to anyone who comes across this site in the future, there will probably be no more updates to this site. As you could probably tell, I no longer have time to update this site and my game profile has been deleted due to inactivity. Unless Titan continues to update this site, this site will no longer be updated.To future viewers, welcome to this site and enjoy the pages already finished and posted. I'm sorry and goodbye. Happy Thanksgiving! I've got some free time now so I figured I can at least add the latest updates for you all! They go in order from newest to oldest! It's been a busy fall! Here's some new things for this month. John O'Lantern has a gift for all! Do not get too attached though, this special companion will slowly be eaten throughout November, and eventually disappear. A new island is available to explore. It has come to our attention that there are no ranches left on Pinto again. We are doing a small reset to just add some more ranches. Hopefully that will be enough for a bit. If not, we'll plan on adding more for the next reset. New Fancy Llama tack. A new, higher stat llama tack was added this reset. The design came from the player, Walker. Some new ranches added to Starfish Isle. New ranches added. They are on Starfish and Tail Isles. I plan on adding these eventually, but I'm just looking for help around the site right now. You can either message me in game on Dun server (TitansCurse), comment below, or send my uCoz (this) a private message. Santa has a gift for all! Do not get too attached though, this special companion will slowly "melt" throughout January, and eventually disappear. The wandering Holiday Horse is back and provides a great reward if you can find it on the main Horse Isle! New breed: Sicilian - All colors but Roan, Pinto, and Cremello. Will be updated as soon as we find everything! New companion: Elephant Calf - Looking for that one now! New breed: Plateau Persian - All colors but pinto and roan, found on desert terrain. Also, the art contest ends tomorrow. I wish I'd gotten on sooner so I could join!